V2583. 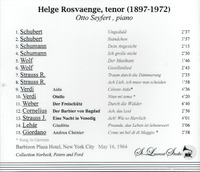 HELGE ROSVAENGE, w.Otto Seyfert (Pf. ): Songs by Schubert, Schumann, Strauss & Wolf; Arias from Aida, Otello, Andrea Chénier, Eine Nacht in Venedig, Giuditta, Der Barbier von Bagdad & Der Freischütz. 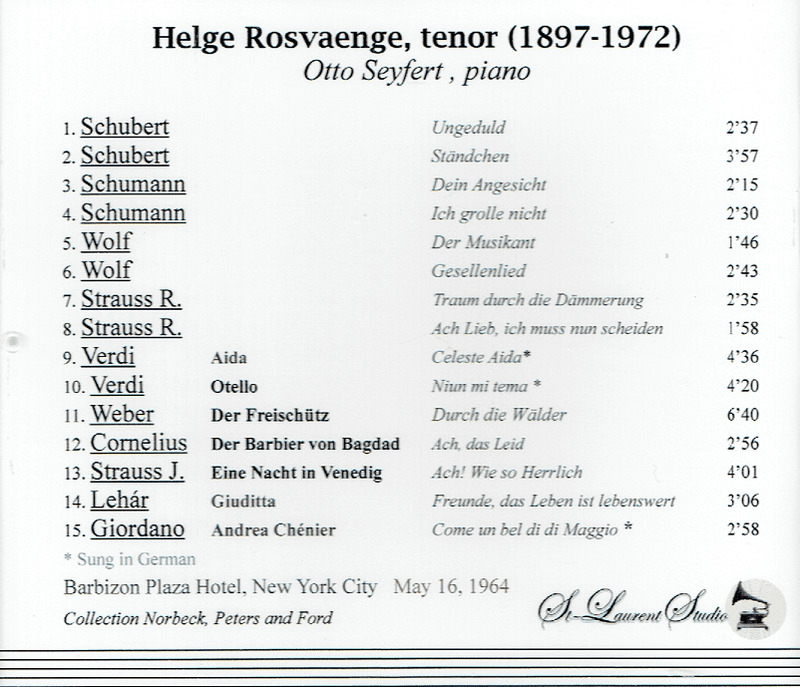 [In addition to the glory of Rosvaenge's stunning operatic arias, this live recital offers as well the Lieder aspect of his notable career - once again before a deliriously grateful audience!] (Canada) St Laurent Studio YSL T-764, Live Performance, 16 May, 1964, Barbizon Plaza Hotel, New York. "I was at the Rosvaenge concerts in 1963 at Carnegie Hall, and 1964 at the Barbizon Plaza Hotel. These New York concerts were recorded and are an amazing demonstration of superb technique, passionate singing, and extraordinary communicative skills, and at age 66 and 67!!! At Carnegie Hall Rosvaenge sang the top tenor arias back to back - no tenor singing today would attempt even half of that number." 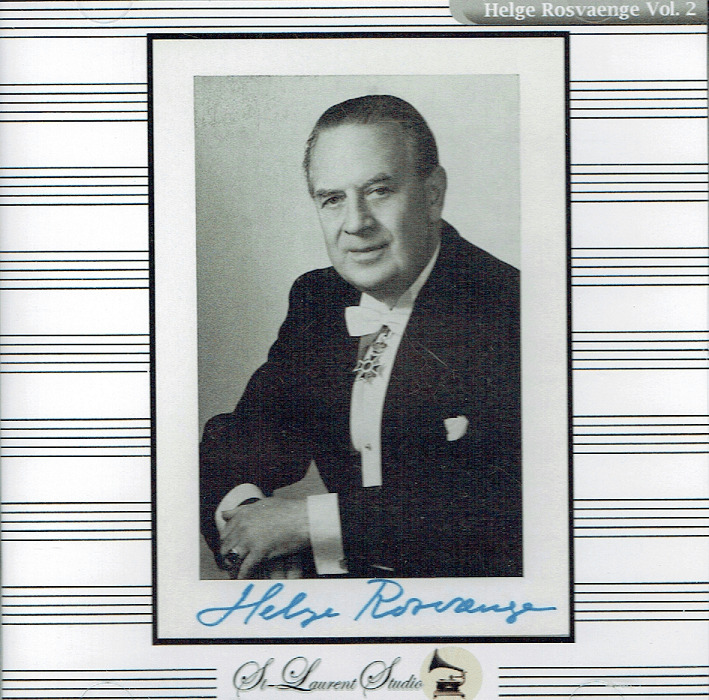 "Helge Rosvaenge, the noted Danish tenor, spent most of his career in German opera houses. A star at the Berlin State Opera from 1929 to 1945, he was a member of the Vienna State Opera after 1930 as well as a guest singer in other major European houses. He sang Parsifal at Bayreuth in 1934 and 1936, a variety of roles at the Salzburg Festival both before and after the war and appeared at Carnegie Hall in 1963. He was known for the beauty of his voice and the expressivity of his delivery. Despite his nationality he was a pronounced German nationalist and apparently a sincere Nazi, joining the party in 1933. He appeared at the 1939 Nuremberg party rally, was highly regarded by Nazi officials and was one of the foreign artists esteemed by Goebbels for helping to support the German war effort by participating in Wehrmacht request concerts on German radio."